I recently had the pleasure of spending ten days of vacation in the beautiful state of Montana. This was my third trip to the area, and this trip solidified my love for the state. That’s mostly because I love the outdoors and beauty that is found in nature, and this place is perfect for that. 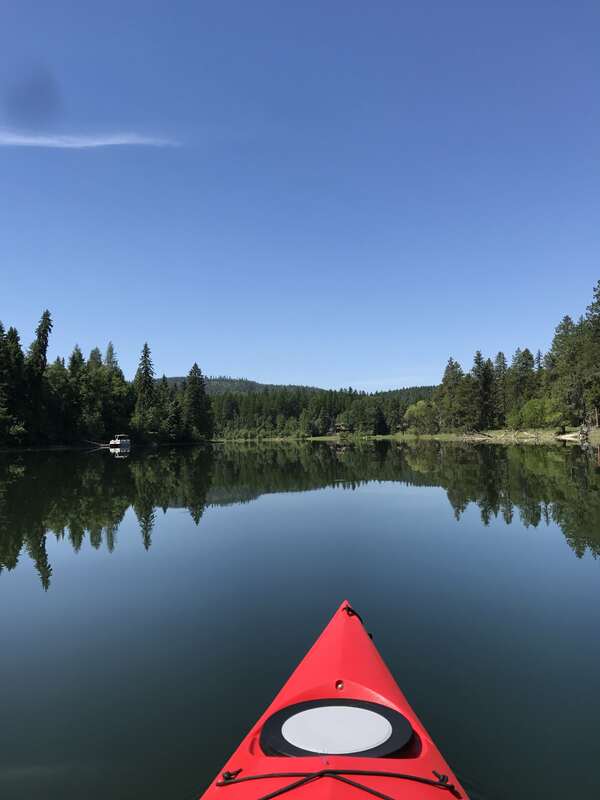 The trip focused on the Kalispell and Bigfork areas, in the northwest area of the state up near Glacier National Park and not too far from the Canadian border. Here are some of the wonderful aspects of the trip. Jewel Basin, which is a popular hiking spot with many trails to choose from. We opted for a four mile walk up to the Twin Lakes. And when I say “up,” that’s what I mean! These were true mountain lakes, which were located on top of a mountain. We were the only people on this trail, so the feeling when we stood on top of this view, all alone against a backdrop of mountains was just about indescribable. Simply beautiful. Also, you can see the white flowers in the front of the picture. 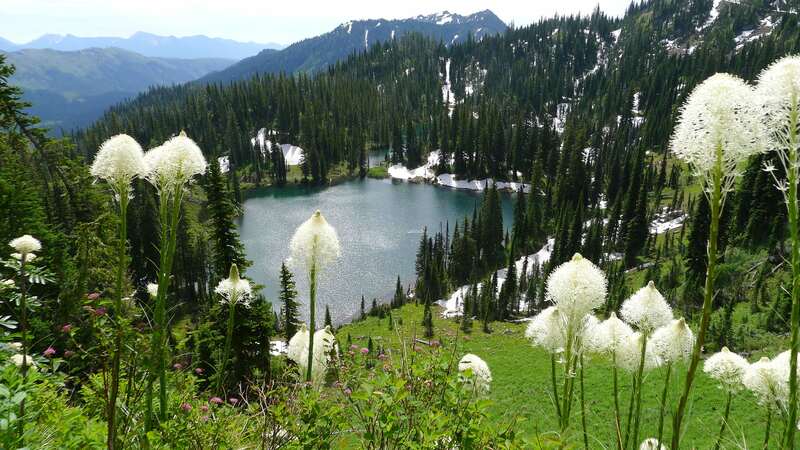 These are called Bear Grass. We were very lucky to see them, as they only grow once every five to seven years. Apparently, bears will eat the roots of the plants, digging them up to do so. I kept my eyes out for any patches of ruined flowers. If I had seen any, I would have been ready to run! 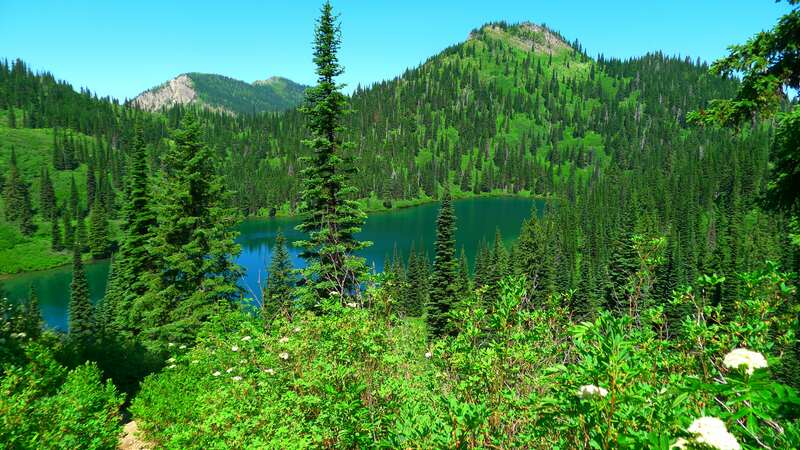 We also hiked several other trails including the Strawberry Lake Trail, which was north of Jewel Basin. It was a six mile route that was relatively difficult with lots of switchbacks. It ended at Strawberry Lake, which provided a great spot for wading in the water and relaxing with a nice picnic lunch. We then attempted to continue the hike up the mountains to the south, but the path was not used much and too overgrown, so we returned to the Lake, and then back to the trailhead. Kayaking: We enjoyed a leisurely paddle down the Swan River. The kayak company dropped us at the starting point with our kayaks, and picked us up when we finished. The ~seven mile ride included lots of scenery of gorgeous mountains, pretty river homes and a large eagle who let us paddle up to him and watch. I would definitely recommend this activity! Swimming: One morning when my husband was fly fishing (see next item), I headed over to the Wayfarers State Park in Big Fork. I was able to spend the morning laying in the sun relaxing with my book. Aaaah. Fly Fishing: My husband hired a guide named Josh who took him down Flathead River for a four hour fishing journey. This was really a training experience for him. It was just the two of them drifting down the River. My husband was able to catch five or six trout, and had a fabulous time. He’d highly recommend this journey. If you’re not a water or woods enthusiast, there is still more to do! There are outdoor concerts every Sunday in BigFork during the summer months. There was a small charge to get in. Once there, you could rest and relax under the Montana sky while enjoying music. I noticed quite a few people who brought in dinner and wine as well. The night we attended, we were able to watch a band called The Bad Larrys which played all sorts of fun acoustic music. We also timed our trip correctly! From our cabin, we had a view of the Flathead Lake. This came in handy on the 4th of July as we watched fireworks from the back porch. The Miracle of America Museum in Polson, Montana was a hoot. It looks like a big junkyard as you pull up, but is actually quite well organized with many different types of exhibits. Antique cars, motorcycles, and spark plugs joined unique instruments, a helicopter, boat, weapons, and a ton of other items on display both inside and out. This was well worth a half day trip. We also visited Glacier National Park which is an amazing place. Driving the Going-to-the-Sun Road is an experience that can’t be missed. There doesn’t seem to be such a thing as a guard rail in the state (slight exaggeration, but not by much). Driving on a skinny two lane road for fifty miles on the side of huge mountains is something you just have to do in order to appreciate it. Of course, this review doesn’t even touch on the food in the area, which might have to be a separate post. We ate well, enjoyed the outdoors with wonderfully warm and dry weather, met some fabulous people, and fell more in love with the state of Montana than we had already been.